Comfort food central! Starch + cheese = just the right amount of “not good for you” to be good for you! Seriously, cholesterol aside, this dish will have your family begging for more. It’s so much better than the box, trust me. I don’t remember ever having this homemade anywhere, it’s just something I like the convenience version of and decided to make it “real”. Nothing premade here! Plus, there’s bacon. Right down to the nitty-gritty. far too much water. I can’t think of anything besides pasta where more water is better. It just takes longer to boil! Salt the water to taste, like you would for mashed potatoes. I use about a teaspoon. 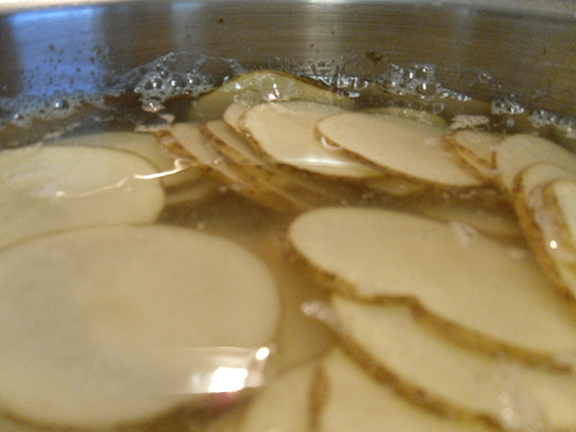 Boil until tender but not mush. About 15 minutes. If your slices are small, start checking around 10 minutes. Pop the lid on and get started on the béchamel. 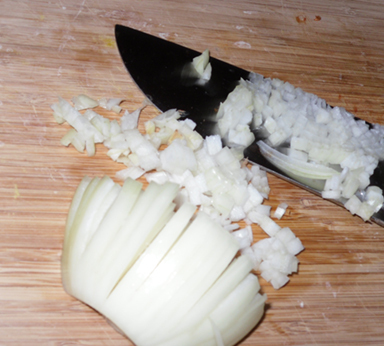 cooking the garlic and turning it bitter. Toss in the flour and stir until the dry is absorbed. Slowly whisk in your milk until the flour is combined and not lumpy. Continue to stir until the mixture comes to a simmer boarding on a boil. For most dishes utilizing a béchamel this is the thickest your sauce will get. If you skimped on the flour it will be thin – but luckily the baking will firm it up a little in the baking process. Now add your cup of cheese. You can use any cheese you fancy here or even a mixture. I used good ole’ cheddar this time. 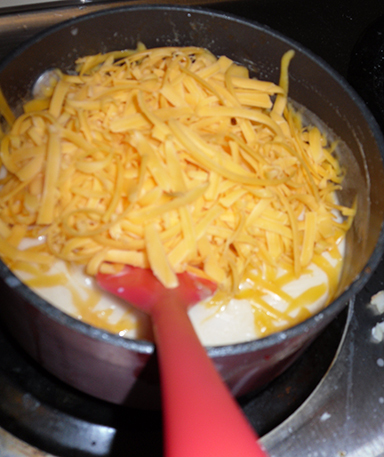 Stir the cheese in until the sauce is smooth. 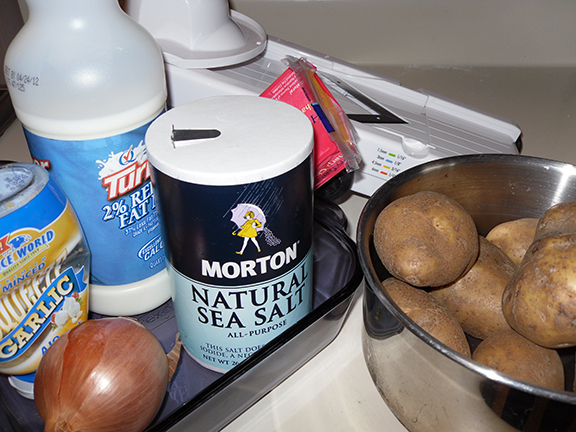 Assembly: Drain your potatoes and place half in the 8×8 dish. Pour half your sauce on top. Repeat. Now at this point you can add bacon crumbles if you had to fry up bacon to get your bacon grease (or had some leftover, I know – I know, leftover bacon is a myth) and extra cheese on top. Bake in a 350 degree oven for 30 minutes. The top will be nice and brown and bubbly. Let sit for 10 minutes after baking to firm up. 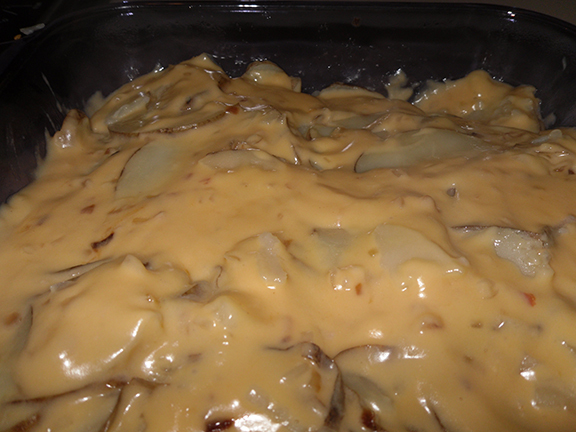 Tah-dah – a nice homemade side that took almost no effort to make. Cutting and stirring, that’s about it. 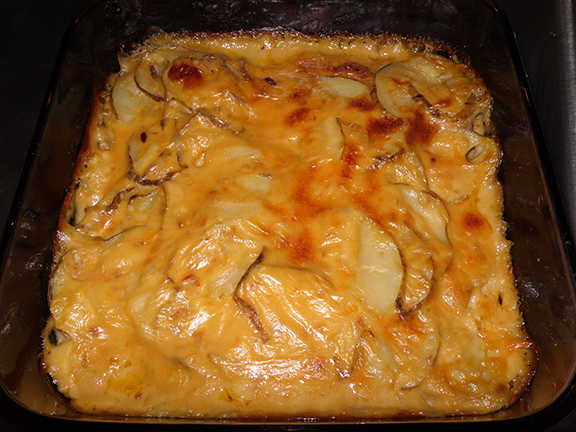 Now with your new found skill, take a minute to search the net for gratins… the results will astound you. You can slice just about anything up, cover it in cheese, bake and have a tasty meal. Go to town!